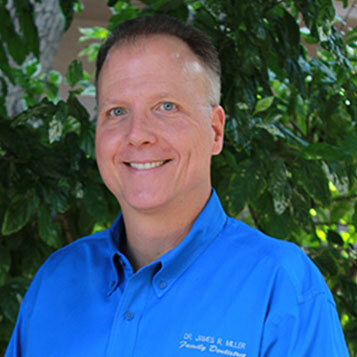 Dr. James Miller attended the University of Miami for undergraduate studies, and earned a Bachelor of Science in biology and chemistry in 1988. His postgraduate studies took him to the University of Florida College of Dentistry, where he earned his Doctorate of Dental Medicine in 1992. Dr. Miller’s postdoctoral residency in advanced education in general dentistry was completed through the University of Florida College of Dentistry, St. Petersburg clinic in 1993. He joined Family Dentistree shortly thereafter. Dr. Miller lives in Bradenton with his wife, son, and daughter.